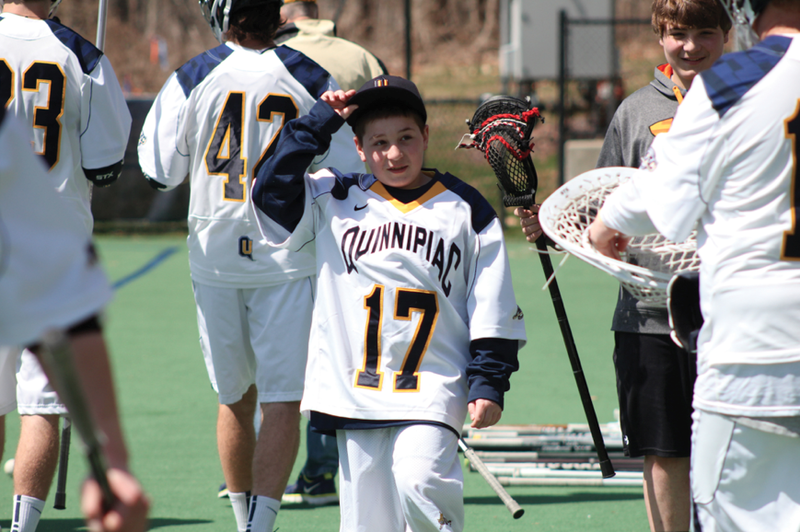 The sun soaks the Quinnipiac turf as the men’s lacrosse team walks onto the field for yet another home game. 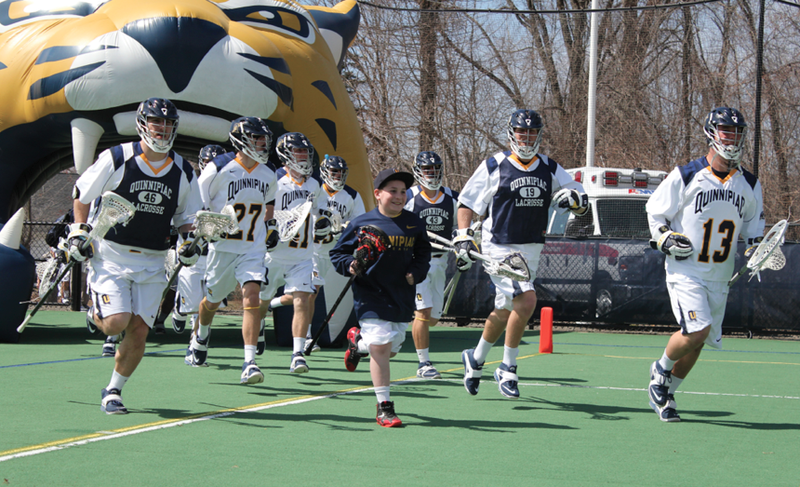 Leading the Bobcats onto the field isn’t their captains or coach; it’s a 12-year-old boy named Connor Scalia. Connor has been battling Congenital Central Hypoventilation Syndrome (CCHS), which is a rare respiratory disorder. On top of that, he has had Chiari malformations, a structural defect of the cerebellum, that have required him to have brain surgery in the past. Connor was introduced to the Quinnipiac men’s lacrosse team through Team Impact, an organization that pairs children with terminal or chronic illnesses with a college team. Their goal is to give children the chance to feel what it is like to be part of a team. Head coach Eric Fekete sees this as a chance for Connor to feel connected even as physical limitations plague him. Quinnipiac was a natural fit for the Scalia family, since they are fans of the school and attend ice hockey and lacrosse games regularly. Connor’s mother, Alyssa, was looking for something more than just a team to adopt her son. She was looking for the team to have an impact on her son’s life. “What I was hoping to get from this was some role models for Connor and to show him there are ways of being involved in a sport without necessarily being able to play the sport,” Alyssa said. The Bobcats immediately took Connor in and made him a member of the team. He is a fixture at team activities such as team yoga, team meals, joining them on the sidelines during games and traveling for certain road games. The team treats him like one of the guys. The men’s lacrosse team may have changed the Scalia family for the better, but the impact Connor has had on the team may even be greater. Connor has changed how the Bobcats look at the game and their own athletic abilities. Pat Corcoran, a junior midfielder, grew up around lacrosse. His father started and coached his youth lacrosse program, but he never understood why parents coached for no pay. His dad told him it was to give back to the community. Greg Pendergast, a junior defender, was constantly around college teams growing up because his dad was a football coach. He can relate to Connor because he sees a bit of his younger self in him. While Connor has impacted the entire team, he has had the biggest effect on senior attack Brandon Kuring. This past fall, Kuring tore his ACL and thought his playing career might be over. Having Connor there has helped spin Kuring’s perspective. “Being around Connor has made me realize there is more to a team than just being a player,” Kuring said. “It’s also being there for the guys and trying to get the morale of the team up. On top of his injury last fall, Kuring can relate closely with the Scalia family because his cousin is battling a terminal disease. Thanks to Team Impact, the Bobcat family and the Scalia family have become one, and Connor and his family fit into the bigger scheme of Fekete’s vision for the men’s lacrosse program. “There are so many kids playing and so much talent out there, but we’ve still relied philosophically here that we want to identify the best players, but bring in the best quality people to this program,” Fekete said. 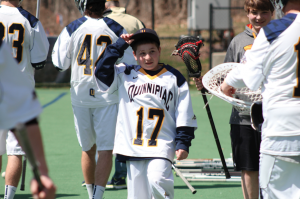 The Bobcats have their youngest member of their team, and while he may not play on the field, Connor Scalia’s presence on the team is just as important to those who are on the field.